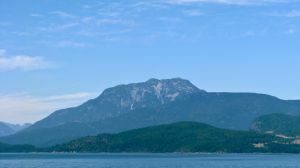 This peak is #79 in Prominence List for British Columbia .This peak rises west of the mouth of Bute Inlet and east of Frederick Arm. Its south side is steep forest and the north face has a couple of steep 600m rock buttresses rising above Egerton Creek headwaters. Old logging roads in this valley would provide access if passable to foot traffic. One can approach by boat or floatplane in to Estero Basin to the north. There is a great pic of Estero in the Pacific Yachting cruising guide to Desolation Sound. Name Notes: Estero was named by the Spanish expedition which in conjunction with the English under George Vancouver, charted the Straight of Georgia and Desolation Sound.